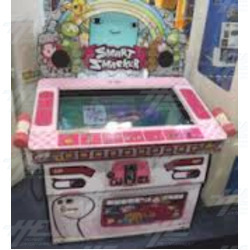 Smart Smacker Redemption Arcade Machine from Andamiro USA takes the form of a ‘whacky' quiz and is aimed at children. Functioning as either a one or two player machine players use the small hammers to strike the screen to select the right answers to the questions, which come in the form of matching colours or shapes. Aimed for children 5 years and up this video quiz game is fun for all ages and provides hours of fun. So dont miss out on this fun and exciting Smart Smacker Redemption Machine from Andamiro. The perfect addition to any collection! Smart Smacker Redemption Arcade Machine from Andamiro USA takes the form of a ‘whacky' quiz and is aimed at children. Functioning as either a one or two player machine players use the small hammers to strike the screen to select the right answers to the questions, which come in the form of matching colours or shapes. Aimed for children 5 years and up this video quiz game is fun for all ages and provides hours of fun. So dont miss out on this fun and exciting Smart Smacker Redemption Machine from Andamiro. The perfect addition to any collection!